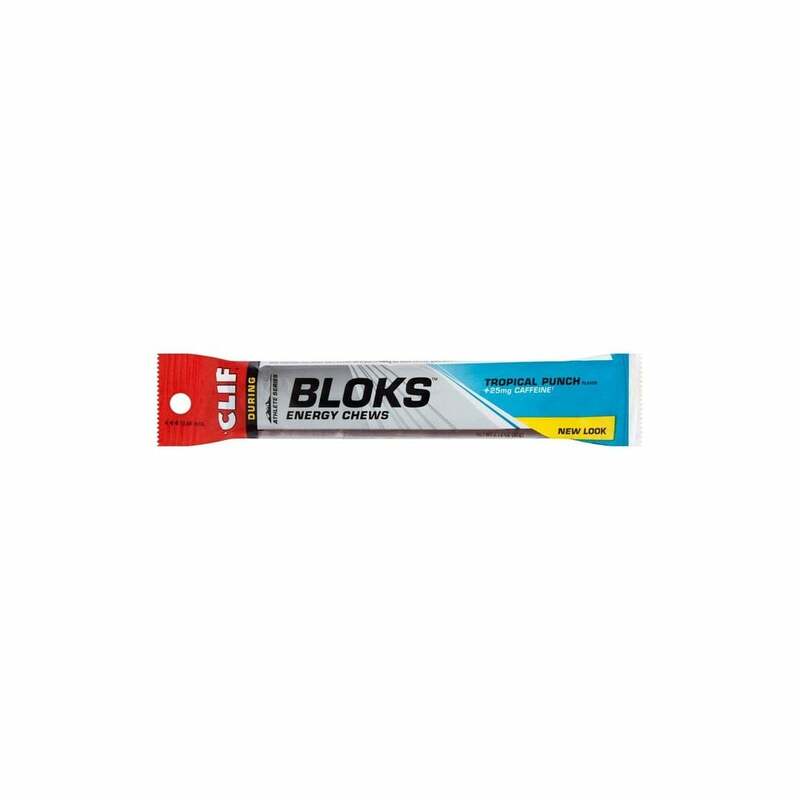 Clif Shot Blok Energy Chews Tropical Punch + Caffine are used by Endurance Athletes such as Cyclists, Marathon Runners, Ultra Runners, Mountain Bikers, Triathletes and Adventure Racers. Any performance-oriented athlete needing a quick burst of energy can benefit from Clif Shot Bloks. The unique Fastpak is sleak and slim and it is easy to stuff a pack of shot bloks in your pocket and race vest. Shot Bloks replaces Carbohydrates and Electrolytes during activity and is great for athletes who don't get on with gels or are looking for a complement. We at myRaceKit love the fresh flavours and easily chewable consistency of these bloks. Ingredients: Organic Tapioca Syrup, Organic Dried Cane Syrup, Organic Maltodextrin, Pectin, Citric Acid, Colored with Black Carrot Juice Concentrate, Natural Flavor, Potassium Citrate, Green Tea Extract, Sea Salt, Organic Sunflower Oil, Carnauba Wax. 100g provide o320 kcal and 80g of Carbohydrate. Each pack contains 6 cubes of 10 grams each and provides 50mg of Caffeine in total. Se image of label for further information. We at myRaceKit love the fresh flavours and easily chewable consistency of these bloks.